You want bleak - there's more than enough of it to go around in "The Road", a film that packs a massive emotional and psychological punch. This film adaptation of Cormac McCarthy's Pulitzer Prize-winning book delivers the goods when it comes to its depiction of how the post-apocalyptic world might actually look and feel. 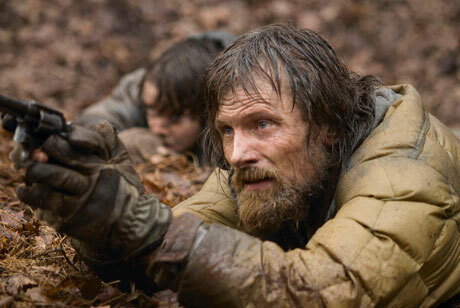 Viggo Mortensen plays the nameless lead, "dad" as he is called by his son, Kodi Smit-McPhee and it's Mortensen's performance that is the key to the film's success. Mortensen, as he has proven in movies like "The History Of Violence", plays the strong, silent type about as well as any actor on the planet. He was born to play his role as a man whose lone mission is to protect his son from the dangers that have suddenly befallen the now dying world. From ruthless gangs straight out of "Mad Max" to straight-up cannibals scattered across the barren land that our planet has become, Viggo sells his desperation to the point that what appears on the screen is reality; the most you could ever ask for from any film. Although the subject matter is, as mentioned before, extremely bleak, the film manages to find hope amongst all the loss and despair. We see the depth of what man is capable of, but also the ultimate sacrifice that a father will make for his own son. "The Road" takes you on a journey that you will not soon forget and ultimately, one that you should, and need to take as well.